Happy Go Lucky captures the exhilaration of a new romance with luscious red berries, silky orchid, and Japanese plum floating on a cloud of amber vanilla. Each month Scentsy offers a Scentsy Fragrance of the Month so check back for February’s Scent of the Month and scent review. 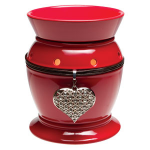 See more Scentsy Scents on their product page.